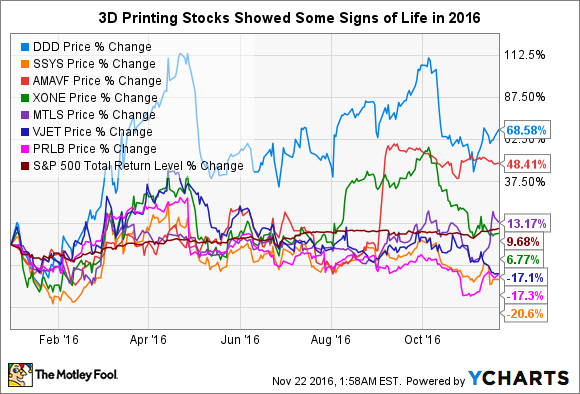 Interested in 3D printing stocks? Here are the top events of 2016 that you should know about. There have been countless newsworthy happenings in the dynamic 3D printing space in 2016. Since our readers are largely investors, this article's focus is on events that involve or could affect the diversified 3D printing industry leaders, 3D Systems (NYSE:DDD) and Stratasys (NASDAQ:SSYS). Pure-play 3D printing stocks in general have been getting clobbered since 2014, and most are still down significantly from their all-time highs. However, there have been some signs of life in the group in 2016. The stocks of 3D Systems and Swedish industrial metals specialist Arcam (NASDAQOTH:AMAVF) are having a great year. They're up a whopping 69% and 48%, respectively, through Nov. 21. 3D Systems stock's rise can probably be largely attributed to bottom-fishers entering the market, given the stock has been extremely depressed since early 2015, and to optimism related to the changing of the guard in the CEO position. The company's business itself, though, is still struggling. Arcam's stock had already been having a solid year before General Electric (NYSE:GE) announced in September its intention to acquire the company, an event that caused a nice pop in its stock. Data by YCharts. Stocks in the chart not already mentioned include ExOne (XONE), Materialise (MTLS), voxeljet (VJET), and Proto Labs (PRLB). All but Proto Labs are pure-play 3D printing companies. Throughout 2016, 3D Systems and Stratasys continued to experience the weak market for their enterprise 3D printers that began in early 2015. Stratasys' management has attributed the major slowdown in purchasing among industrial customers to a glut of 3D printers in the field thanks to the large number of machines that were purchased during the previous few years. Management has also said on recent earnings calls that it believes the increased number of product offerings buyers have to choose from is lengthening the sales process. It seems probable to me that at least one additional factor has been at play: Some businesses have been holding off on new 3D printer purchases -- we're talking big-ticket items that can go well into six figures -- to see what new offerings would soon be brought to market. It had been widely known well in advance of their spring launches that 2D-printing giant HP Inc. (NYSE:HP) and venture capital-backed Carbon planned to launch speedy 3D printers for enterprise customers. On April 1, Carbon launched its M1 3D printer powered by its compelling Continuous Liquid Interface Production (CLIP) 3D printing technology, a photochemical process that company co-founder and CEO Joseph DeSimone unveiled and demonstrated to great fanfare at the TED 2015 conference. The M1 was available immediately via a subscription service. Carbon has touted CLIP as being 25 to 100 times faster than the leading 3D printing technologies, possessing immense materials possibilities, and capable of producing polymer parts with excellent mechanical properties. Carbon has raised a whopping $222 million in venture capital. Its impressive list of backers include Google Ventures and GE Ventures, the venture capital arms of Alphabet and General Electric, respectively. The company also has some notable partners, including Ford. In April, 3D Systems named longtime top HP printing exec Vyomesh Joshi, or "VJ," as CEO. The company had been operating for five months without a permanent CEO, after former leader Avi Reichental abruptly departed in late October of last year. It's widely believed that Reichental was shown the door by 3D Systems' board. The last several years of his 12-year tenure at the helm was characterized by nonstop acquisition activity, likely at the expense of nurturing the company's existing businesses. It wasn't long before Joshi completely shook up the C-suite. His most notable move occurred in July, when he brought on John McMullen as CFO. Though McMullen was plucked from the top financial spot at Eastman Kodak, he had previously worked with Joshi at what was then Hewlett-Packard Co. and is now HP Inc. In June, 3D Systems announced the resignations of its chief operating officer and chief marketing officer. Neither slot has been filled. In May, HP launched its Jet Fusion 3D 3200 and 4200 printers, powered by its proprietary Multi Jet Fusion technology. The more powerful 4200 was slated to begin shipping in the fall, while the 3200 will be available in 2017. HP claims these polymer 3D printers are up to 10 times as fast and twice as cost-efficient as 3D printers powered by the leading technologies. Like Carbon, HP's goal is to disrupt the manufacturing sector. 3D printing has been slow in making inroads into production applications beyond very specialized low-run ones for several reasons, namely production speed and materials constraints. At launch, HP announced a bevy of A-list partners, including Nike and BMW. On July 1, seasoned Stratasys board member Ilan Levin assumed the top spot at the company, replacing longtime CEO David Reis, who retired as CEO but remains on the company's board. There's no indication that Reis was forced to resign as CEO. In September, General Electric announced plans to acquire two industrial metal 3D printing companies, Arcam and Germany-based SLM Solutions, for a total of $1.4 billion. The takeover of SLM fell through in October after a billionaire hedge fund operator acquired enough shares of the company to block the deal. He wanted the industrial giant to raise its offering price, which already represented a significant premium to SLM's value based on the level at which shares were trading on the Frankfurt exchange at the time of the offer. GE didn't do so, and several days later, it acquired Concept Laser, another German maker of metal 3D printers. The combined deal is the largest deal ever in the 3D printing industry, and it will move GE beyond being just the world's largest user of metal 3D printing technologies to also becoming a leading supplier of them. The company's goal is to generate $1 billion in 3D printing revenue by 2020. For perspective, 3D Systems and Stratasys generated $650.4 million and $670.5 million, respectively, in revenue over the last year. With HP and Carbon entering the polymer 3D printing space -- which comprises the lion's share of 3D Systems' and Stratasys' businesses -- and General Electric intent on becoming a major supplier of metal 3D printing technologies, 2017 promises to be an action-packed year in the 3D printing world.